The Molly is one of the first choices of many amateurs: it is easy to maintain and even more to reproduce. In addition, with its many possible colours, there is something for everyone. A perfect species to start well! How to feed the Common molly / Black molly? 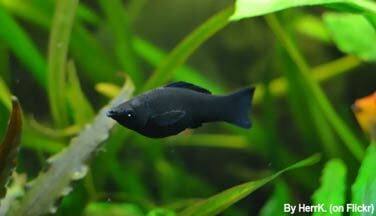 What kind of behavior does the Common molly / Black molly have? The Molly has a very good behavior, including in a community aquarium. It will be peaceful even if some lawsuits do happen from time to time. The males are fiery Romeos, and it will take 2 to 3 females for each male. Indeed, a female is likely to die of exhaustion in the face of the tireless courtship that makes it suffer the male. It is therefore necessary to distribute this energy on several females! In addition, it will fill their need for community life because the Molly is a gregarious fish. If you make a little sudden movement in front of the aquarium, you will see them running away at all fins! To avoid stressing them, approach slowly and do not surprise them. Who can live with the Common molly / Black molly? 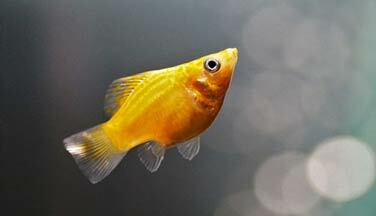 There is not a lot of fish adapted to the rather high GH preferred by the Common molly. This is why it is recommended to keep it in a specific aquarium. Note however that it can coexist with the Green Swordtail and the Platy, but beware of overcrowding that can very quickly happen with these fish ovoviviparous (provide an aquarium of at least 250 liters / 55 imp gal / 66 US gal in this case). For more experienced aquarists, you can add them to a shoaling of fish-archers (Toxotes jaculatrix) or tetraodons (Fluviatilis and Palembangensis). 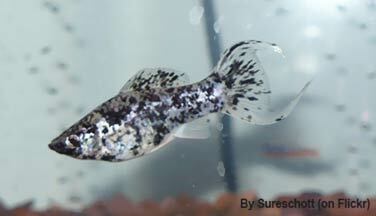 How to breed the Common molly / Black molly? More than easy, since the breeding takes place as soon as the two sexes are put in presence, under condition that the water does not contain nitrates. The male fertilizes the female with the help of its gonopod (fertilization is internal). The female gives birth to between 30 and 50 fry regularly (every 30 to 50 days). You will be quickly invaded! Note that females can give birth to fry even if they have mated only once because they have the capacity to store the sperm of the male for several months. The fry are born already formed and autonomous (no laying, they are ovoviviparous fish, eggs develop in the belly of the female). It is not necessary to put the pregnant female in a nest (synonymous with stress, poor water quality, lack of oxygen...) because the small fry are only very rarely worried by adults. The growth of fry is fast if the temperature is hot enough and the water of good quality. Fry food: Artemia nauplii and/or flakes powder, if possible 4 to 6 times a day. Last point of vigilance: consanguinity. Do not keep in your aquarium only the offspring, but sell/give your fry. Another method: introduce new sexually mature individuals from time to time, either by buying them or by offering exchanges with other amateurs. Which aquarium for the Common molly / Black molly? Molly is quite active and swims a lot. Go on a minimum of 150 liters ( 33 imp gal / 40 US gal) but keep in mind that with its frenetic breeding, the more space you have the better! For an ideal maintenance, a slightly brackish water is preferable even if it is not obligatory. For this, you can dilute 5g (1 teaspoon) of coarse salt (untreated and unfluorized Guerean salt type) for 10 liters ( 2 imp gal / 3 US gal) of water. This will prevent a lot of parasites and will provide a water quality close to the natural environment. Be careful, however, that plants can support such salinity (such as Anubias or Java moss for example). Another alternative to keep a fairly high water hardness: integrate calcareous rocks in your decoration and control the GH regularly. The Common molly will also appreciate a fairly planted aquarium (which will also allow females to escape the males). The addition of floating plants is also a good way to offer some infusoria to fry (such as Najas or Ceratophyllum demersum). It is advisable to renew the water of the aquarium every week, by 10 to 20% (with new water containing the same salinity). Finally, install a filtration of power equal to at least 3 times the volume of the aquarium per hour. 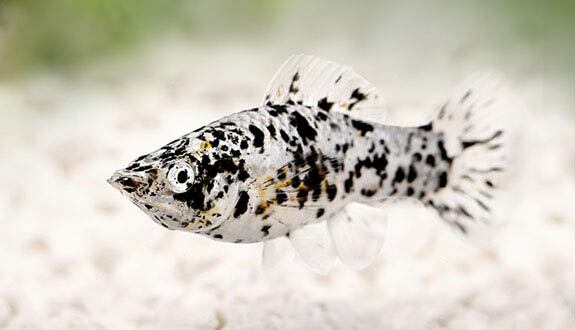 What are the colours and patterns of the Common molly / Black molly? In nature, the Molly can be found between rivers and the sea, hence its ability to live in brackish water. 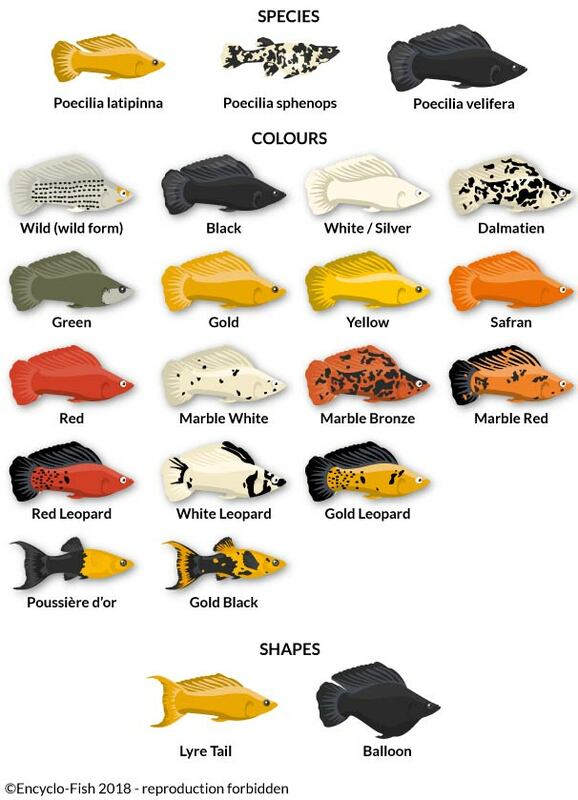 From the wild form (black fish spotted with yellow), we find today many colours of Common molly: white, gold, saffron, dalmatian, orange, black, gray... It also exists in different forms such as "Molly lyre"
The variety "balloon" which is in fact a malformation (strong scoliosis) very cruel for the fish: painful swimming, various metabolic disorders, poorly-formed organs, problems during spawning, very high risk of mortality of the female during the birth of the fry... We can only encourage you to boycott such fish (regardless of its species by the way) in order not to encourage this commercial practice which does not care about the quality of the fish’s life. Although the species is generally quite robust, it is still susceptible to white spot disease and fin rot. In general, these problems appear in case of stress, general weakness or if the water is too soft. Moreover, note that Molly can live in freshwater, but they will be more fragile and more sensitive to diseases than in brackish water. The Black Molly gives birth to fewer fry but these are larger than those of other chromatic variants. Beware, Guppies and Mollys can hybridize. Hybridization is undesirable because it produces sterile, poorly formed and fragile individuals. 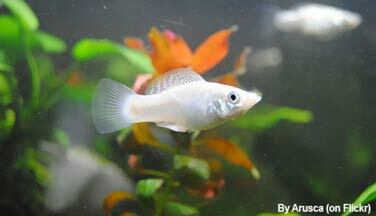 On the other hand, the Molly does not hybridize with the Platys or the green swordtail.